Many Asians find it difficult to express love and appreciation, perhaps due to their conservative nature. From a simple “thank you” to “I love you”, many do not seem to utter these phrases anymore. "What's Your Love Letter?" campaign was first initiated in 2015 to encourage more people to pen down their love by bringing back the long lost art of writing. This year, Julie’s is a taking a step further by encouraging everyone to put in a little effort to treasure the good times of togetherness. 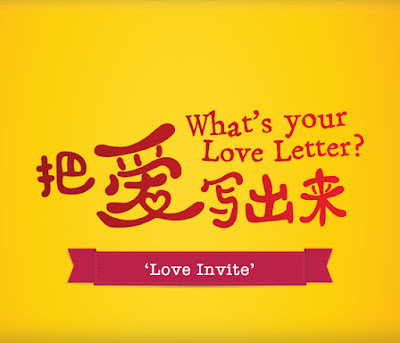 Using ‘Love Invite’, it allows you to extend an invitation to people whom you are grateful for in life this Lunar New Year. So put your heart on paper this Chinese New Year and join Julie’s in sending smiles today. Either physical voucher or e-voucher must be presented upon payment. For purchase of prefaced pint or quart in a single receipt only. Valid at all AEON supermarket nationwide. Not valid in any Baskin-Robbins retail outlet. Not applicable for Baskin-Robbins promotion or discount item. Not refundable, returnable or exchangeable for cash. Golden Scoop Sdn Bhd reserves the right to add, change, discontinue, postpone or terminate this voucher without prior notice. Promotion is valid for (1) One Double Sized Bingsu for RM25 per transaction only. Offer valid from 15th December 2016 to 30th April 2017. Customers are required to show "Love Invite" coupon before entitled to the promotion. Coupon is not exchangeable and non-refundable for cash. Not valid for other promotions, discounts, vouchers and seasonal menu items. Caffe Bene Malaysia reserves the rights to amend the terms and conditions at its absolute discretion without prior notice. Coupon must be presented upon receipt of pizza. Surcharge applies for selected crust, Classic and First Class Pizza range. Not valid with any other promotion and discount. Valid for delivery, take away and dine in. Valid till 31st March 2017. Original Voucher must be presented upon redemption. Valid from 15th Dec 2016 to 31st March 2017. Not valid with any other on-going promotion packages, offers and/or discounts. Not redeemable or exchangeable for cash. Maximum 6 pax per redemption per voucher. Outside food and drinks are strictly not allowed. Not refunds will be entertained due to inclement weather, natural disaster and/ or force majeure. The redeemed voucher is valid for one entry only and non-transferable. It is a condition of entry that visitor agrees to be bound by all rules & regulations displayed at KL Tower Mini Zoo. Available at KL Tower Mini Zoo only. Book a South America Package and get RM500 off per person. Book 3D 2N Ho Chi Minh @ RM499 and get RM50 off per person. Buy 2 Gardens by the Bay, Singapore tickets @ RM110. Valid from 1st Jan 2017 to 31st Oct 2017. All bookings have to be done 1 month before departure date and are subject to the hotel room availability EXCEPT South America Tour Package which requires a 6 months advance booking. Consumers are not allowed to transfer/ resell travel vouchers after booking. This voucher cannot be exchanged for cash and change of other packages are at Oriental Grace Travel's discretion. Super peak season surcharge applies on Chinese New Year, Labor Day, National Day, Christmas and School Holiday. Voucher to be presented upon ordering. Voucher is redeemable for any ala carte items in a single receipt of RM30 and above. Not valid with other promotions, discounts, privileges and offers. Valid at all Secret Recipe outlets except KLIA, KLIA 2, PPUM, KTIA, PGIA, Subang SkyPark, Medini Mall and Tapah R&R. Voucher cannot be returned, refunded or exchanged for cash. Only original vouchers are accepted and replacements of damaged vouchers are not available. The management reserves the right to reject any vouchers that have or appear to be tampered. The organizer reserves the right to discontinue, postpone, reschedule or cancel the usage of this voucher without prior notice. Valid from 15th December 2016 - 30th March 2017. Original voucher must be presented at point of redemption. Valid from Mon - Sun including public holidays. Promotion is not redeemable or exchangeable for cash. Promotion is not valid with on-going promotions, vouchers or discounted items. Contact True Fitness's respective outlets for more info. Valid only at www.zalora.com.my / ZALORA mobile app. Valid till 30th April 2017, 11.59pm. Valid with minimum purchase of RM100 and above. Voucher code only applicable to items sold by ZALORA. Brand and item exclusions apply. Products sold by ZALORA partners are excluded. Not valid with other promo codes and promotions, unless otherwise stated. Free delivery is only applicable on paid price RM75 and above. ZALORA Malaysia reserves the right to change the terms and conditions or cancel any promotion at any time without notice.